Termites are usually not covered by Household Insurance leaving many hardworking Australians, like yourself, stressed and out of pocket. Termites cause hundreds of millions of dollars worth of property damage every year in Australia and unfortunately in most cases the damage expense is not covered by regular home insurance. They can burrow long distances underground to reach their desired food source. If you find a nest in your back yard, chances are they have already infiltrated your home, you just can’t see them, yet. Termites are most active in the warmer months, so if you see Flying White Ants emerge in Summer then you definitely have a Termite infestation. Also, termites have been known to be serial offenders, coming back to finish the meal they were making of your beloved home, so on-going termite management and prevention is crucial. Some clients enquire about white ant treatments, but termites and ants are very different insects. Termites are not a member of the ant family but the term ‘White Ant’ is firmly embedded in the Australian language. Our Expert Termite Specialists have many years of professional experience and are all fully qualified and comprehensively insured. Our Insurance covers us for Public Indemnity and Professional Indemnity which gives you complete peace of mind. A termite inspection is highly recommended to be carried out annually by the Australian Standard AS3660 even if you have termite protection systems in place. Generally, termite protection systems make termites easier to detect, however won’t actually stop them from attacking the property or building. Also, your current termite protection system may be malfunctioning or compromised in someway, which you will need to be aware of. Our Termite Treatment services fall in to two main categories, Preventative and Remedial. 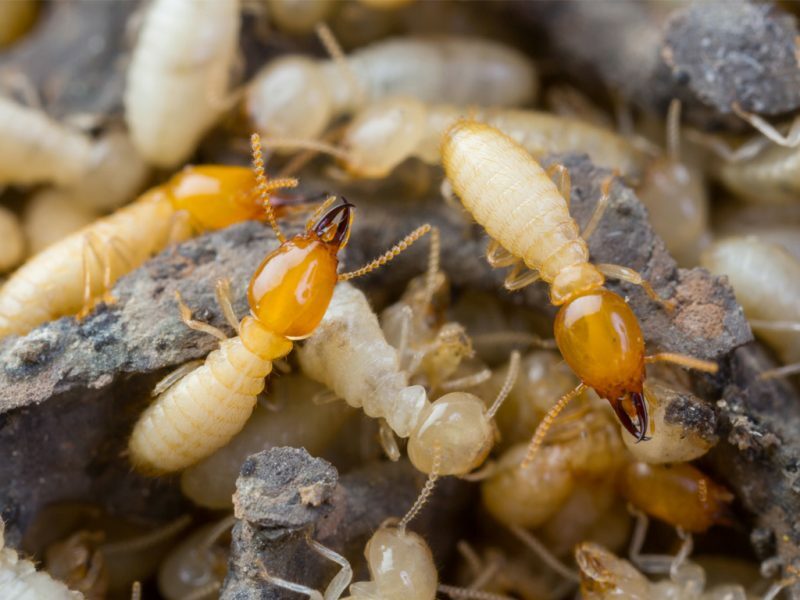 Once you have taken advantage of our On-site Termite Inspections and Assessments you will be provided with a customised range of Termite Treatment and Termite Management options to suit your particular needs. Remedial Treatment is followed up with various Preventative measures. After an inspection and evaluation have been completed, our Licensed Pest Control Technicians will provide you with the best options for your situation. Physical and chemical barriers designed to deter White Ants. After your inspection and evaluation we can provide the best options for your particular situation. Interesting Fact – The average Termite that Australians come across is white in colour or an off-white. The colour of a Termite is usually determined by their choice in diet (timber). A darker coloured timber, like redwood for instance, when ingested will give the termites a darker colour. A lighter coloured timber will not change the colour of the termite so much. Get a Free Quote for Termite Inspection and Control services – Just Call Jim’s Pest Control on 131 546 or Book Online at a time that suits. Although the business is still growing, we enjoy a lifestyle which is less demanding, and more rewarding. I have a saying I use when I converse with other franchisee's, my franchisor, the call centre and other business owners, when asked how's my day going. " I'M LIVING THE DREAM "
It's great experience to be a part of a Jim's Group. I never looked back. It's an amazing journey so far . It' has been the best investment for least amount of money for the best return. The Franchise has added an additional level of income over my original business, which has been a great help to me. It has been really hard work but very rewarding,there nothing better than having control than when and where you want to work and the lifestyle it can provide. It has been one of the best decision I made business wise.